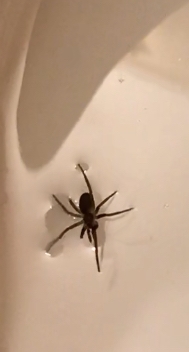 I’m 99% sure this is a hacklemesh weaver spider. Found indoors this evening, after I brought some boxes and furniture home that had been unattended in our camper for a few weeks. It was crawling across a satin pillow on the living room floor, and was scooped up and put in the toilet before I got a decent pic. But after reviewing all of the spider types in our area, the hacklemesh weaver is the best guess I could come up with.